Just a few days ago, I saw a young mother holding her infant daughter while standing in line for service on her automobile. I asked her about the sandals she was wearing. 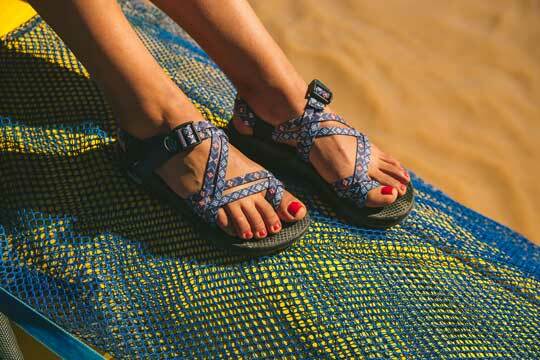 They appeared to be Chacos, a brand I was curious about, but had never bought. I thought they were out of reach of my pocketbook, and continued to admire them from afar. But she said they were, and that they had been a college graduation gift from her mother. Five years ago! She said in the five years, she had replaced the straps, but other than that, she had no problem with them. They look really good on her. She seemed comfortable standing there holding that fat little baby. My feet were hurting so, I was about to get out of line and go sit down. When I got home, I looked under the bed, and once I started fishing out the shoes there with a broom handle, it looked like an archeological dig. There were old sneaks and sandals that were practically fossilized from disuse. As each one came into the light of day, I remembered why they had been tossed onto the bone yard. This one had a broken strap I was supposed to have repaired and hadn’t. That one was so badly scuffed it no longer matched its mate. One had gotten run over by my car. Don’t know why I was holding on to it. But when I thought about five solid years of wear and the great looking condition of those Chacos, I decided it was time to put my money were my feet were. Whatever I had thought of the price before, they suddenly seemed worth it. I searched Groupon and found a good deal online and used one to purchase a great looking pair. I loved that I could design the look myself and I saved 30% off my purchase. I also found they had an impressive selection of boots available. And they offered promo codes to unlock even more deals and special prices on their merchandise. I’m so glad I chatted up the young mother in the auto repair shop that day. It seems I’m going to be a mother this year, too. It’s good to know I’ve purchased a pair of Chacos sandals that will still be around when my child goes off to kindergarten.